PCa is among the most common and heterogenous neoplasms nowadays. Pathological levels of steroid hormones as testosterone and vitamin D and damaged androgen homeostasis are directly implicated in the onset, aggressiveness, transformation and progression. Mutant genes of AR and VDR receptors ensure a selective advantage of the metastatic androgen-independent subtype PCa, protecting its behavior active even after androgen deprivation therapy. We report our study on the length of AR (CAG)n and 3’ VDR Polly A microsatellites in 57 blood specimens of PCa patients. The aim was to determine the prognostic value of both markers for predisposition to PCa. An attempt to correlate the genotypes with indolent or advanced disease was made. 41% of all patients with PCa showed shorter AR CAG lengths (e.g., ≤20 repeats), which is associated with high risk to develop PCa. In the control sample the reported CAG lengths ≤20 repeats are 27%. The shortest AR CAG alleles: 15/16/17 repeats were found in the most aggressive PCa cases with advanced CRPC, metastases and biochemical relapse. By genotyping of Polly A microsatellite in the 3’ UTR of the VDR gene the detected alleles and the corresponding allele frequencies are: short alleles SS 17/17; SL 17/23; SL 17/24; SL 17/25 - 34,2% and long alleles LL 23/23; SL 17/23 - 26,3%; SS 24/24; SL 17/24 - 35,9%; SL17/25 – 1.75%. The following distribution of VDR alleles in our PCa cases was observed: SS 12%; SL 47%; LL 41%. The present data coincides with the reported ones in Europe. In the control samples the following alleles are registered: SS 20%; SL 43% and LL 36%. 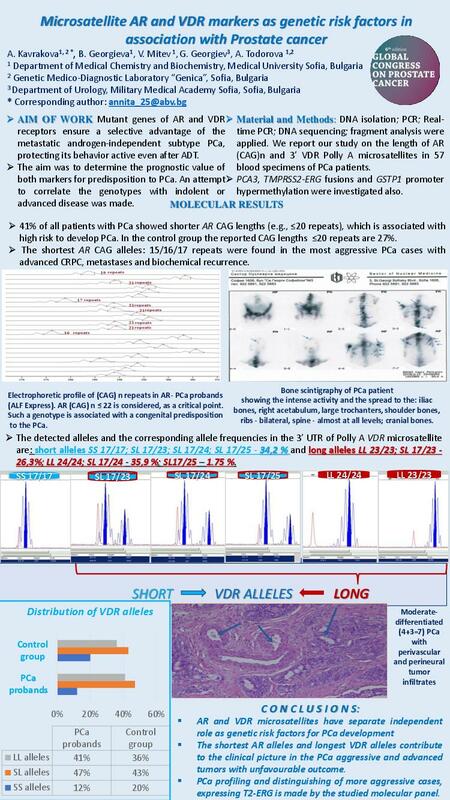 In the group of PCa patients with longest VDR alleles 24; 25 in homozygous or heterozygous combinations the clinical manifestation was compatible with androgen independent behavior, biochemical relapse and advanced CRPC. Almost all patients in the studied group were registered with neoplastic GSTP1 allele and PCA3/PSA x 100 > 30. In PCa patients with shortest AR alleles and longest VDR alleles, a positive TMPRSS2-ERG fusion status, representing a sign for aggressiveness was also found. Such patients with triple positive profile were determined histologically as poorly-differentiated and moderate-differentiated tumors by Gleason. In conclusion, both AR and VDR microsatellites have separate independent role as genetic risk factors for PCa development. The shortest AR alleles and longest VDR alleles contribute to the clinical picture in the PCa aggressive and advanced tumors.